Durable and rigid stainless steel construction. Clearly graduated centigrade scales. Proper refrigerator and freezer temperature zones are clearly indicated. Ideal for use in the refrigerator. One year limited warranty on HT100. HACCP touch data recorder. A liftgate will lower the product to the ground for you. 3 in four color resistive touch screen. It's very important to us that you are happy with your order. Rotatable Digital . Working temperature range for the body, 0 ℃ ~ 50 ℃. Display Type: Digital. Temperature Range: -50 Celsius~300 Celsius. Protective plastic sheath. Power Source: 1 x AG13 Button Battery(not included). DO NOT leave inside the oven whilst cooking. Size: 7.5cm (3") dial. Usage: for Cooking, Drinks, Barbecue, Milk, Coffee, etc. Great tools for kitchen food. 15 minutes auto shutdown for power saving (option). Accuracy: 0.0 ° C to 80 ° C ( ± 1 ° C or 2 ° F), Other Range ( ± 5 ° C - 10 ° C or 10 ° F - 20 ° F). BlueTherm™ Probe Bluetooth fast response temperature probe. This stainless steel, fast response, BlueTherm needle penetration probe incorporates a heavy duty ribbed, polypropylene handle. The probe is suitable for liquids and soft semi-solid materials including fish, fruit and other soft or delicate materials. Place or Stick it On your fridge. for Indoor Outdoor Almost Anywhere. 0n a file cabinet. Temperature range: -20 to 50 Degrees Centigrade. And Lot more. 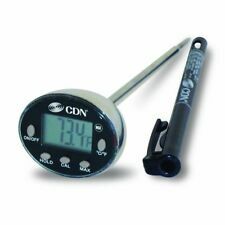 Kitchen Craft Stainless Steel Heavy Duty Jam, Preserve & Frying Thermometer. Other range ( ±5℃ - 10℃ or 10℉ - 20℉). MAJOR FUNCTIONS AVAILABLE:-. select On/off, ℃/℉ buttons. REFRIGERATOR FREEZER. Ideal for use in refrigerators. cell batteries ( included ). Power: 2 x 1.5v LR44 button. Distinguishing temperature: 0.1°C. Accuracy: ±1°C. 328° to 752°F (-200° to 400°C) temperature range. Under no circumstances can we take back an item that has been used. A liftgate will lower the product to the ground for you. Tundra was started in Boulder, Colorado in 1993 – over 20 years ago. NSF approved. Easy to Read dial. Range from 0-220°F. One year limited warranty on HT100. Includes HACCP touch data recorder (COMHT100) and micro-tip penetration probe (PK15M). A liftgate will lower the product to the ground for you. 3 in four color resistive touch screen. 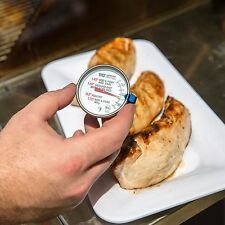 Precise and easy temperature reading. 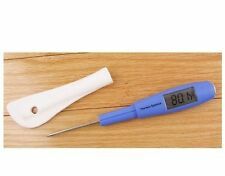 Kitchen Craft Stainless Steel Meat Probe Internal Temperature Thermometer. Clip to side of pan. Wash product in hot soapy water before first use. We are here to help. Kitchen Craft Shelf Hanging Fridge & Freezer Traditional Temperature Thermometer. The thermal detector is in the area between 1.3 cm and 5 cm from the beginning of the spike. Temperature range 0 ° C to 250 ° C. Made of stainless steel.